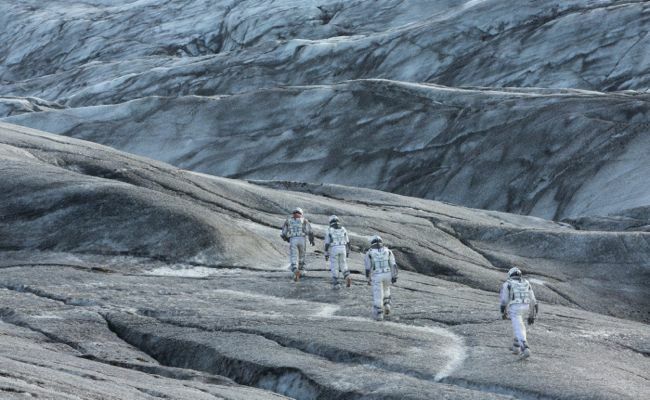 Christopher Nolan’s entertaining sci-fi epic “Interstellar” is a swashbuckling adventure set in the far reaches of space with a mix of scientific fact and flimflam, and lots of black holes, wormholes and plot holes. There are wondrous images and exciting sequences although it is fashioned less rigorously than Nolan’s polished gem “Inception”. 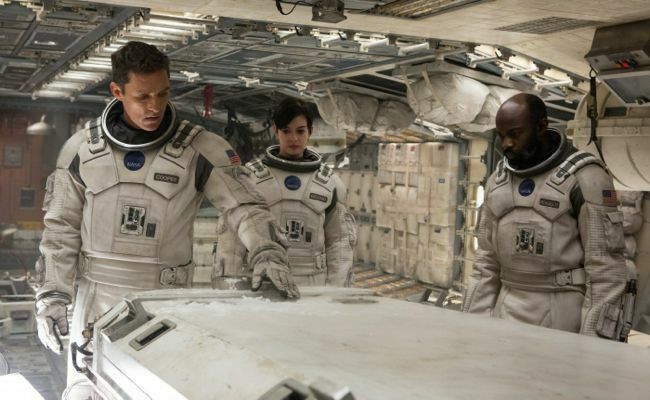 The nearly 2-hour 49-minute film has a ponderous start that allows time for several questions to be raised before it propels Matthew McConaughey on a wild ride through the galaxy and beyond. The Oscar-winning actor plays Cooper, who is more like maverick flyer Chuck Yeager from “The Right Stuff” than a cool astronaut like Neil Armstrong. He’s struggling with his family in dust-bowl America following a terrible blight and he laments that with NASA closed he’ll never get the chance to follow in his heroes’ footsteps. All the more strange, then, when with help from his endlessly curious daughter Murph (Mackenzie Foy) he stumbles upon a hidden compound that turns out to be NASA’s secret hideaway. Once inside, he learns that a venerable professor played by Michael Caine is busy on an outer-space project named Lazarus that he hopes will find a new home for human beings on a faraway planet. Cooper is told he is the only man for the job, which raises the question of why nobody had bothered to tell him and what might have happened if his daughter hadn’t driven him to find the compound. It also raises the question as to how NASA, which struggles for funding in good times, could possibly have the means for such an ambitious project. Not to mention how they keep all the dust out. In no time, Cooper along with the professor’s scientist daughter Amelia (Anne Hathaway), astrophysicist Romilly (David Gyasi) and co-pilot Doyle (Wes Bentley) are blasting off to parts unknown. There is a series of sequences that show off Nolan’s utter mastery of such cinematic splendour with help from cinematographer Hoyte Van Hoytema, the visual effects wizards at London’s Double Negative and composer Hans Zimmer, whose cues and orchestrations are as breathtaking as what’s on the screen. As the complications of the flight increase and hazards multiply, logic ceases to matter much and with several surprises along the way, the film becomes hugely entertaining. Nolan, who scripted with brother Jonathan Nolan, takes time for some reflective moments and there is a very moving scene in which Cooper sees video of his children as they age faster at home than he does in space. The acting is spot-on and McConaughey makes a believable roughneck adventurer and compassionate father. Anne Hathaway never looks the part of a pioneering scientist but, mercifully, she does not break into song although she does prattle on at one point about love as another dimension that should help guide their actions. There is the brief hope that Cooper might hit the button of an ejector seat that would send her off to join George Clooney in orbit but he simply ignores her and the moment passes. Mackenzie Foy fits the bill much better as Cooper’s intelligent young daughter and she grows up to be Jessica Chastain who successfully carries the burden to sustain suspension of disbelief as the pull of gravity is stretched. John Lithgow, as the grandfather, and Carey Affleck, as Cooper’s son, would hardly have known they were in a sci-fi picture as they never leave the dust-bowl but they add to the verisimilitude. British actor David Gyasi (“Chuggington”) does well as one of the crew. Nolan has fun with concepts of time and gravity and he does not belabour the point about why our planet might be doomed. Science, rightly, is held to be our potential saviour but there is an alarming glimpse of what our future home might look like even with added dimensions … a small American town complete with little league baseball. Like most depictions of heaven, it rather resembles a kind of hell. Editor: Lee Smith; Visual effects supervisor: Paul Franklin; Producers: Emma Thomas, Christopher Nolan, Lynda Obst; Executive producers: Jordan Goldberg, Jake Myers, Kip Thorne, Thomas Tull; Production: Syncopy, Linda Obst Productions; Rating: UK: 12A; US: PG-13; running time: 169 minutes. 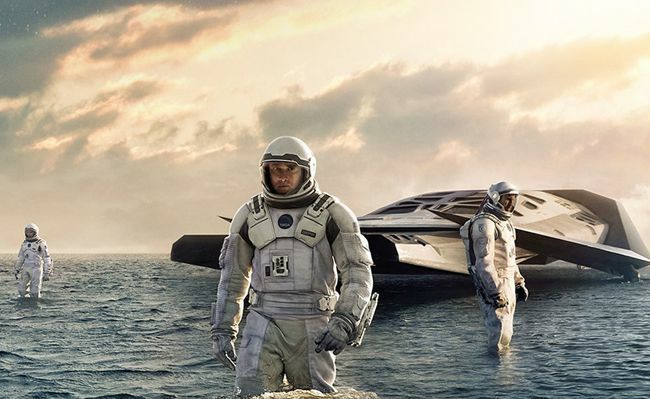 This entry was posted in Film, Reviews and tagged 'Interstellar', Anne Hathaway, Christopher Nolan, Double Negative, Hans Zimmer, Jessica Chastain, Matthew McConaughey, Paramount, Warner Bros.. Bookmark the permalink.